Winter's not done with us yet: It's already freezing, but an arctic front will bring that cold to bone-chilling levels Wednesday afternoon, as well as a possible dusting of snow. A winter weather advisory will be in effect from 2 to 9 p.m. Wednesday for much of the region, including the District; Anne Arundel, Charles and Prince George's counties in Maryland, and Arlington, Fairfax and Prince William counties in Virginia, as well as Alexandria and Falls Church. 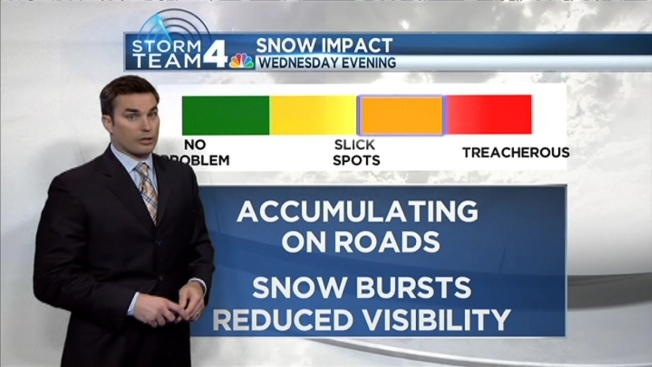 Snow showers and squalls are expected to move into the D.C. metro area in the afternoon and evening, making for an unpleasant trip home. Drivers can expect slippery roads and visibility as low as a quarter-mile during the evening commute. Now about that cold: Wind chills could fall to 10 degrees below zero late Wednesday through Thursday. Earlier this week, a storm brought several inches of snow to the D.C. area, piling up between 4 and7 inches for much of our area. It was enough to shut down all area public schools and the federal government. PHOTOS: First Major Snow Falls Across D.C. Some school systems have also canceled classes Wednesday. Federal agencies are open Wednesday, but employees have the option for unscheduled leave or unscheduled telework. And that chill will stay with us for the next few days -- the cold front that moves in Wednesday afternoon is expected to stick around until Saturday morning. 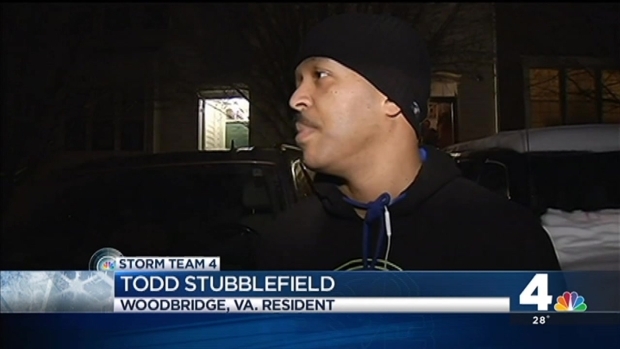 News4's Shomari Stone reports from Woodbridge, Virginia, where residents are preparing their driveways and sidewalks for slippery conditions. Thursday morning will be frigid; the "feels like" temperatures will be below zero for the entire region, with a high of just 18 degrees. Friday, the forecasted low temperature of 4 degrees could break records. Storm Team 4 Chief Meteorologist Doug Kammerer said it could feel as frigid as -20 degrees. Warmer temperatures will move in over the weekend, but expect a mix of snow and rain Saturday evening into Sunday morning.